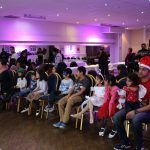 On Saturday 18th December 2016 SPA Coventry hosted a Children’s Christmas party for the first time in a long while. 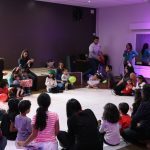 It was a great day for parents with children of similar ages to get together. The idea was suggested by Priya Mistry, who led the arrangements and was supported by Anup Mistry and me (Ravi Mistry) SPA Coventry youth leader. We were able to promote the event through our SPA Coventry Facebook page and also with the help Shaileshbhai who was able to send our fliers out to members via email. 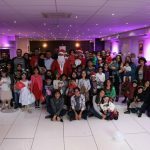 Together we decided to have a number of activities for the children to enjoy, a Christmas kids disco and topped off with a visit for Santa Claus himself, who came with a bag full of presents for all the children. We were supported by a lot of the parents and would like to say a big thank you to Hema Mistry, who donated her time and skill to offer face painting free of charge, Dipika Mistry, who donated cookies and icing for the children to decorate and take home, all the parents who came on the day for the help and support and finally for the £28 donations we collected on the day. Overall it was a fulfilled day for all children and parents. The kids looked liked they had a lot of fun, gave an opportunity for the parents to share ideas for future events and also great to get the community together. We have had some very positive feedback and some great ideas for future children’s events.